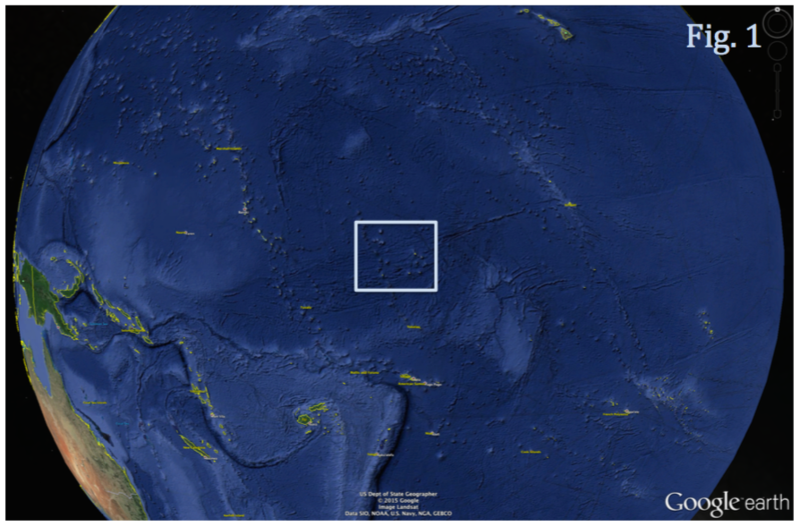 John Smith and his team from the University of Hawaii will join this transruise or transit with science, conducting multibeam mapping and magnetic surveys in the remote waters of Johnston Atoll on three to four seamounts. Considered to be the stepping stone for marine species to colonize the Hawaiian Archipelago, this region has a large number of seamounts and ridges that have yet to be mapped and has high density deep-sea coral and sponge communities. 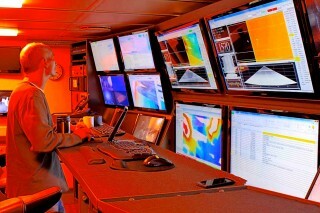 The maps would be used to help plan for two remotely operated vehicle exploration cruises later in 2017. 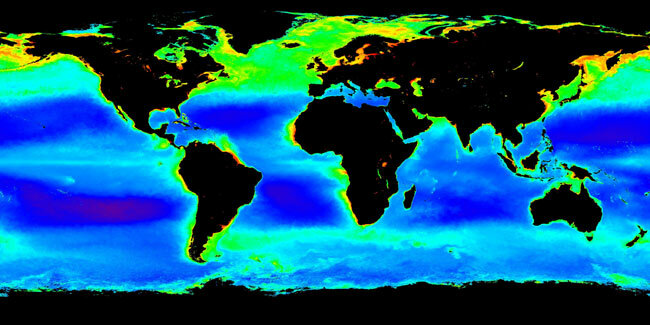 Uncertainties in remote sensing estimates of particle sizes in the ocean remain a limiting factor in understanding ecosystem dynamics and the ocean’s role in the biogeochemistry. Oceanic phytoplankton (tiny plant-like organisms) consist of different-sized cells that play specific roles in the intricate mechanisms of the marine carbon cycle and in ecosystem health. Satellite measurements of particle size distributions (PSD) are vital for understanding these global processes, however, estimates for PSDs remain largely invalidated due to the lack of appropriate “ground truth” datasets. In January, Dr Ivona Cetinić from NASA Goddard Space Flight Center/USRA along with co-investigators Dr. Wayne Homer Slade, Dr. P. Jeremy Werdell, Dr. Margaret Estapa, and the rest of the science team, will test novel instrumentation aboard Falkor for autonomous optical measurement of marine PSDs and examine implications of PSD for carbon fluxes. The team will measure surface marine optical properties and PSDs using a prototype instrument, and will share the data through an established NASA public archive. These measurements – compared and collected to remote sensing readings are key for the calibration and development of algorithms for estimation of phytoplankton community composition, ocean carbon and climate records. This data can substantially reduce the uncertainties in remote‐sensing estimates of marine PSDs leading to an unprecedented view into the mechanics of the ocean. 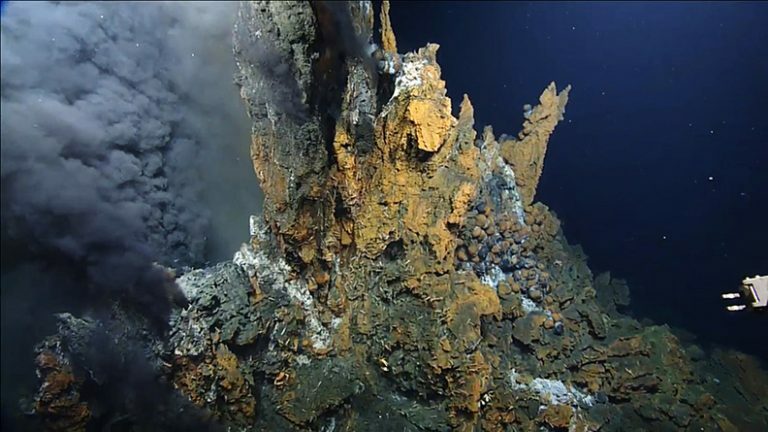 There is still so much that we don’t know about the deep abyssal environment and the distribution of microbial organisms that inhabit this unique ecosystem. Daniela Zeppilli from the French Research Institute for Exploitation of the Sea (Ifremer) and her team will join Falkor in June for the second Transit with Science. 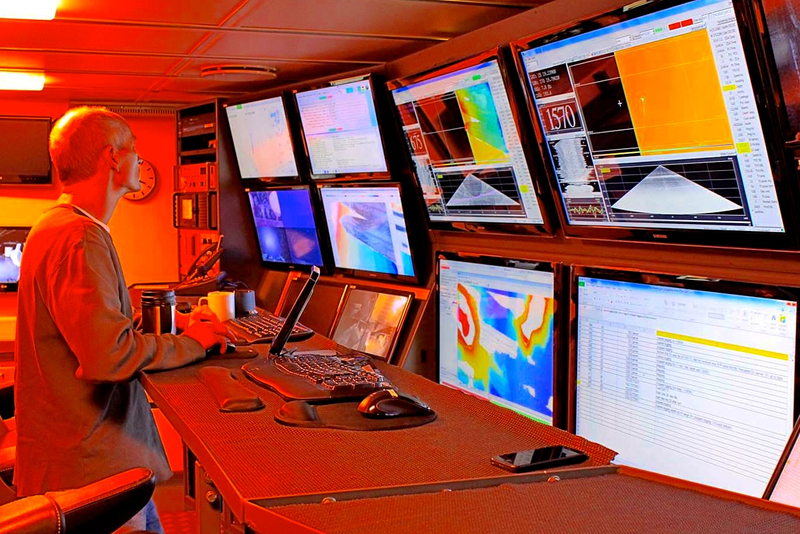 The aim of this cruise is to learn about the biodiversity present in the deep-sea and improve understanding of environmental influences contributing to microbial distribution at these depths. The team will use an approach that will involve analyzing the environmental DNA (eDNA) present in the marine sediment, and the morphological determination of fauna. The second part of this research will explore emerging issues concerning microplastics contained in deep-sea sediments, analyzing their distribution and potential influence on marine life. The scientists will focus sampling on the Alaska Gulf, contributing to a globally representative set of deep-sea samples. A Golden Sea Spray octocoral seen on a previous cruise. 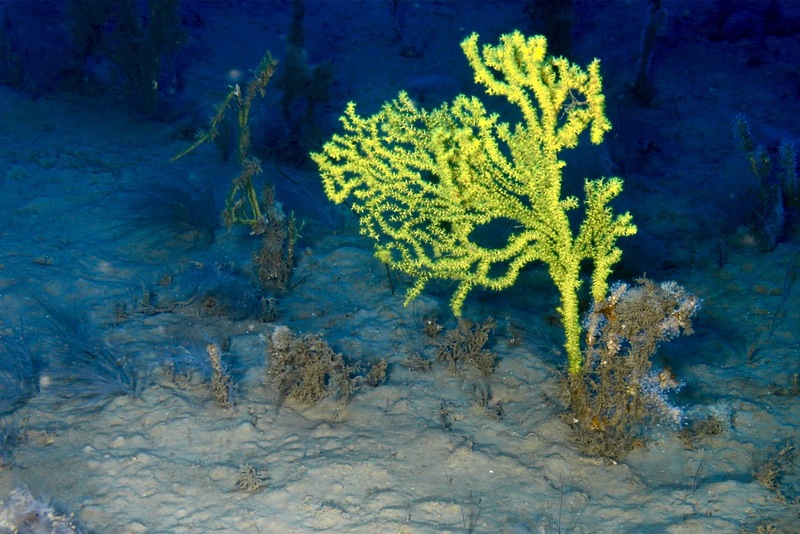 The bathyal zone (800-3500 m) is the least well-known depth zone in the ocean but contains much of the deep sea coral diversity. This species diversity is almost completely different between the Aleutians and Hawaii, with species transition occurring somewhere along the Emperor Seamount chain. Professor Les Watling from the University of Hawaii Manoa and his team hypothesize that this boundary is determined by the west to east flow of North Pacific intermediate water that crosses the Emperor Seamount chain at the Main Gap. These zonal water movements could function as a moderate to strong barrier to north-south species dispersal and may be responsible for faunal transition. In June, the team will sample two seamounts on each side of the Emperor Seamount Main Gap to differentiate water conditions where the corals inhabit. 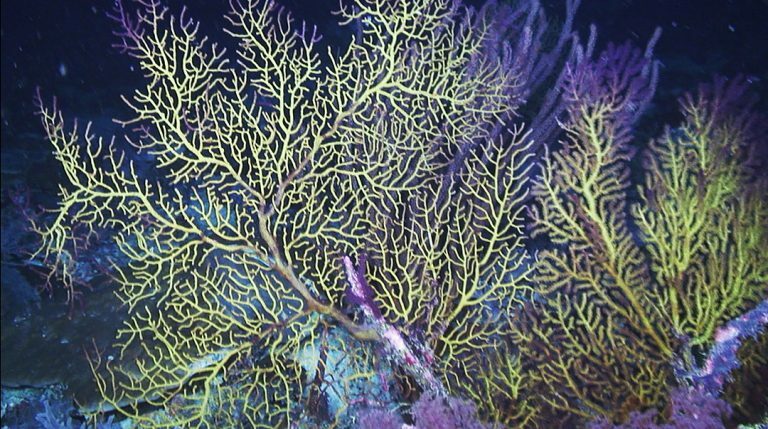 Octocorals are widely distributed at deep depths throughout the world’s oceans, however no specimens have been collected from Emperor Seamount, even though there is evidence of their presence from images collected in previous research. The team is hoping to better understand the distribution of octocoral species on each side of the Main Gap, as well as investigate the processes that influence these distributions. 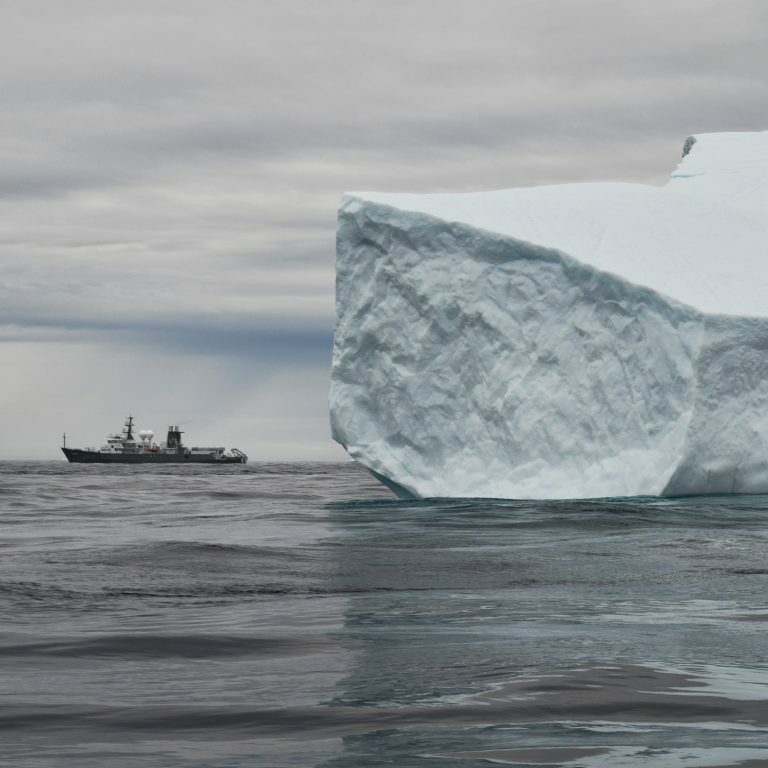 They will first produce detailed maps of the four seamounts (two on the north side, two on the south side) through which major water masses flow in a zonal pattern. The mapping data will help researchers determine sites for a series of dives with ROV SuBastian to collect Octocoral samples for taxonomic and molecular analyses. They will also obtain water samples to better understand the origin and characteristics of the water in which the corals reside. Predicting sea level change is key to understanding coastal populations’ vulnerability to future climate shifts. Fortunately, geological records have preserved the natural swings in Earth’s climate, including the oceans’ related variations. Rapid sea-level change of 120-140 m occurred during the last deglaciation and was a dramatic global response to climate shifts and glacial melting. Tropical coral reefs offer one of the best sea level indicators, and are easily dated by radiometric methods to construct relative sea level (RSL). Such records are used in global models to understand ice-melting and sea level impacts. To date, there are only a handful of coral reef records of deglacial sea level change, but they are insufficient to properly inform predictions for the future. As a result, Professor Ken Rubin from the University of Hawaii Manoa, and co-investigators Chip Fletcher and Scott White will set out to explore sea level rise records from the last ice age using currently drowned central Pacific coral reefs. The science team will look at corals in the Hawaiian Islands (Oahu to Lanai) and Line Islands (Palmyra, Kingman), that showcase climatically important glacial melt water pulses. Hawaii and the Line Islands represent excellent sites to explore because they are far-field from meltwater sources, and lie along a geographic gradient of anticipated sea level differences. Using ROV SuBastian and an AUV, the team will be able to take high resolution images and make observations of coral colony morphology, ecology, and age. This will give us better information from which to build maps and predictions of rising seas. In October, a team of scientists led by Dr. Erik Cordes from Temple University, Dr. Randi Rotjan, Dr. Tim Shank, and Dr. David Gruber will complete the first deep water biological surveys within the largest (405,755 km²) and deepest UNESCO World Heritage Site on Earth. Lying within the territorial waters of the Republic of Kiribati in the equatorial central Pacific, the Phoenix Islands Protected Area (PIPA) represents a significant seamount habitat and provides a unique opportunity to determine the impact of a no take zone in the deep sea. The Phoenix Islands support remarkable abundance and diversity of marine life with over 450 fish species recorded, yet no information is available on the deep coral or other benthic communities below 200 ft. Establishing baseline assessments of deep-sea coral biodiversity and distribution is critical for evaluating the impact of the marine protected area over time. Dr. Cordes and the team will address what species of deep corals are present and if there are new, undescribed species, while examining the biogeographic relationship among the Southwest Pacific, Central Pacific and Hawaiian Islands communities. The scientists will also investigate the levels of aragonite saturation to characterize the effects of seawater acidification upon the deep water corals. This is particularly significant in the Pacific, where the age of the corals in deep waters leads to the accumulation of CO2 and a reduction in saturation state. The work here will examine the spatial variability in saturation imagery taken along transect surveys conducted by ROV SuBastian. This will represent the first data on the deep water carbonate system of the central Pacific and will serve as a baseline for monitoring ocean acidification, contributing to the adaptive management of the Phoneix Islands marine protected area, which is well positioned to be a global model. Submarine volcanism is one of Earth’s most fundamental processes; yet few active volcanoes have been studied, and even fewer have had time series observations from repeated site visits. In November of 2017, an international multidisciplinary team of scientists led by Professor Ken Rubin from the University of Hawaii Manoa will study one of Earth’s most dense and diverse active volcanic provinces in the Kingdom of Tonga. Falkor and the science team will head to the Northeast Lau basin in Tonga, which is known to have a very high density of submarine volcanoes – including 15 young arc volcanoes, multiple lava flows, a backarc spreading center, and 15-20 older volcanic cones. The team will develop a detailed geological and ecological understanding of the terrain to understand volcano distribution and duration, how the volcanoes develop/maintain hydrothermal activity, and how the hyperactivity and geology affect the surrounding ecology. Using an AUV and ROV SuBastain the team will observe individual volcanic structures and macrofauna of the region while collecting a range of chemical, micro and macrobiological characteristics, in addition to water column samples of volcanic emissions.